You are at: Home / Agora / Credit origination and transmission: Are Greek banks part of the problem or the solution? Credit origination and transmission: Are Greek banks part of the problem or the solution? The twin challenge in Greece’s financial sector remains the liquidity position of banks and their lending capacity to the real economy. Any assumption of a quick return to normality and business as usual are premature. Lending volumes to private households and business continue to be anchored on a two-year downward trajectory. As graph 1 below illustrates total lending to the real economy shows no signs of reversing its negative trend line. 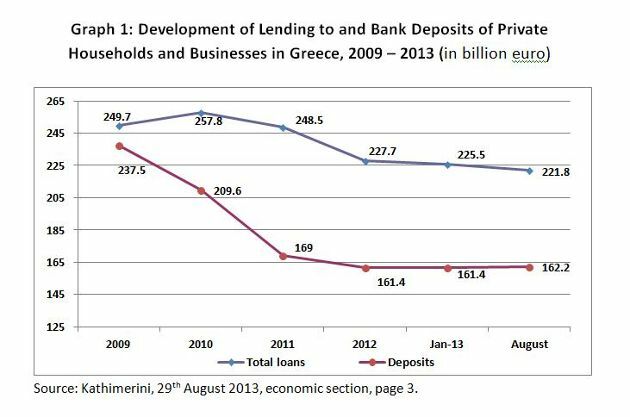 The Bank of Greece reported that in September 2013 credit to the private sector declined by 3.9 per cent year-on-year. The pace of credit contraction was unchanged compared to the previous month. Lending to businesses shrank even more, registering a decline of 4.7 percent in September after a reduction of 4.5 percent in August 2013. Apart from the statistical focus, we should also turn our attention to the quality of lending we expect from domestic lenders. A number of key policy challenges remain and need to be addressed urgently. Greek banks will have to find common ground with the troika and the national authorities on how the accumulated mountain of NPLs can be tackled. While sovereign debt restructuring and debt buyback have become acceptable instruments of policy making in Greece, banks cannot continue to refuse debt relief to their customers. Put otherwise, they cannot decline to implement as lending institutions what they have been asking the troika of international creditors to do for Greece on the sovereign level. 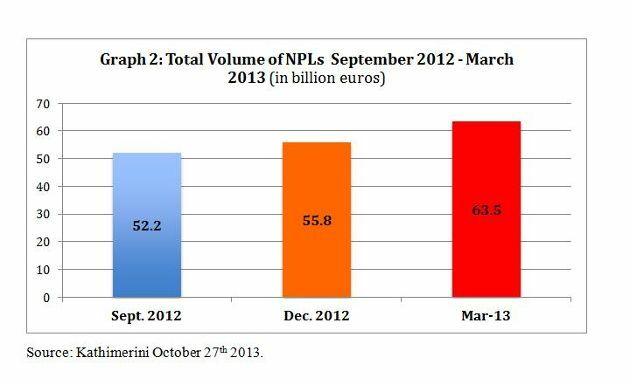 As graph 2 (below) underlines, the total volume of NPLs is reaching ever-higher levels and shows no signs of abating. The 63-billion-euro mark was reached in March of this year, an increase of 11 billion euros compared to September 2012. When broken down into individual categories, consumer loans represent the single largest category of NPLs with a share of 42.4 percent, followed by corporate loans with 27.5 percent and mortgage loans classified as NPLs (repayment delayed by more than ninety days) reaching 22.9 per cent. Such staggering NPL ratios require domestic lenders to step up their provisioning, thus binding already scarce capital. The NPL challenge and the deleveraging obligations facing Greek banks are major impediments to their current lending capacity. The effectiveness of NPL resolution policies will have to be assessed in the coming months as a matter of urgency. The establishment of an asset management firm which would undertake the NPLs will be a recurring demand by banks and a constant bone of contention between the Troika, the Ministry of Finance and the domestic lenders. As NPL formation continues to increase, it requires provisioning and thus binds banks’ capital otherwise available for purposes such as onward lending. As long as no individual or umbrella solution for all banks is found lending volumes will remain constrained in Greece. SMEs and many private households will experience the downside of this situation most immediately. Other stakeholders, including investors expected to purchase shares in the reprivatisation process of domestic lenders in the future will want to have a clear picture of where potential problems and asset liabilities rest before they commit. There are a variety of options such as (i) work out alternatives, (ii) the externalisation of NPLs into a special purpose vehicle (SPV), (iii) selling such loans at a sizeable discount to distress funds, or (iv) the different versions of bad bank arrangements created in Ireland (NAMA) and Spain (SAREB); the former a programme country like Greece and the latter implementing an EU-funded bank restructuring process totalling 100 billion euros. Let us first look briefly at the Irish example, which was established by the government in Dublin in late 2009 in response to the widening financial crisis and the bursting of the credit-led property bubble. NAMA, the National Asset Management Agency was created to enable the transfer of impaired assets including land and development loans from banks such as AIB, Bank of Ireland and Irish Nationwide. The assets were acquired at a discount of roughly 60 per cent book value of banks’ balance sheets. The nominal volume is approximately 74 billion euros. The payment for the distressed assets was not made in cash but with Irish government bonds that carried a variable yield coupon. The asset managers in NAMA will have up to ten years to achieve the most favourable financial return on the loan portfolio. The establishment of NAMA, the process of bank restructuring and the financial commitments to which the government bound itself in 2009 remain a matter of intense public debate in Ireland. Some have argued that it was the key contributing factor for Ireland having to seek a financial assistance package from the IMF, European Commission and the ECB in November 2010. Established in November 2012 SAREB stands for ‘Sociedad de Gestión de Activos procedentes de la Reestructuración Bancaria’ (Company for the Management of Assets proceeding from Restructuring of the Banking System). Its purpose is to enable the segregation of toxic or problematic assets of credit institutions that required public capital injections so as to remove these from the balance sheet of the lenders. The impaired assets are chiefly property development loans. The asset managers in SAREB will have up to 15 years to achieve the most favourable financial return on the loan portfolio. SAREB is comprised of private and public investors from Spain and, interestingly enough also from abroad (Britain, Italy, Switzerland, Germany and France. Private investors have a 55 per cent majority shareholding in SAREB. None of the aforementioned options are simple to implement in Greece. Apart from the highly contentious issue of how to identify the transfer value of impaired assets and who could pay for it, any such option would need clearance from the recapitalisation fund (HFSF) as well as approval from the troika. Divorcing billions of toxic assets such as NPLs from banks’ balance sheets into a separate entity within a bank or outside in an umbrella structure compromising various lenders is the principal idea of a ‘bad bank’ structure. The setting up an internal bad bank would allow the migrating of the lender’s troubled loan portfolio, inclusive of its real estate loans. Today, these assets are only worth a fraction of their original value. Both Piraeus Bank and National Bank of Greece are considering ring-fencing impaired assets from the rest of their loan portfolios through the creation of an internal bad bank institution. But they would need regulatory approval from the HFSF, the Bank of Greece and the Ministry of Finance. The internal bad bank model for Greek institutions would have to resolve one critical issue, namely the financing platform for such an internal bad bank. The question to address is how and who would fund such an institution? External funding by the taxpayer is likely to be a hot button political issue in the post-recapitalisation environment. Furthermore, given its budgetary implications Greece’s international creditors would be rather reluctant to approve such an arrangement. Another option in banks’ efforts to offload their legacy assets such as NPLs is to try and sell them to foreign funds that are currently eying the Greek market for opportunities in distressed debt. The acquisition of NPLs in banks’ loan portfolios is a common practice in the financial sector worldwide, but still constitutes somewhat of a novel concept in Greece. Hence, there is resistance to the idea from the public, which is wary of vulture funds descending on Greece and taking full advantage of its weak negotiating position. Selling legacy assets at a steep discount would also imply that banks account for impairment losses. It is also not clear how much of the accumulated stock of NPLs could be sold. The stock exceeded 65 billion euros in mid-2013 and has not yet reached its peak. 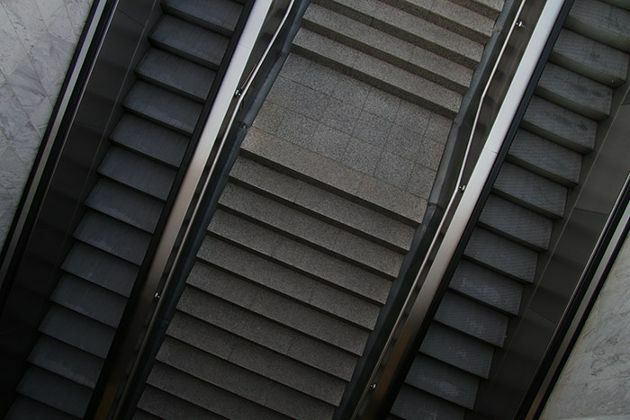 A more positive perspective on distressed debt management has not been helped by the fact that prices being offered for different categories of banks’ NPLs are currently marked at rock bottom. Depending on the kind of NPL and the duration of non-repayment, offers from foreign funds are as low as one percent and seldom surpass the critical threshold of 10 percent. For Greek bankers involved in the negotiating process, the offers put on the table have been nothing less than “humiliating”. More attractive price levels could be achieved by pooling NPLs of different categories (consumer, mortgages and corporate loans) and mixing the time periods which classify them as delayed, e.g. from 90 days up to two years. This more flexible incentive structure is ultimately dependent on a variety of factors that the commercial banks can only influence to a certain degree. Foreign funds active in distressed debt management are looking for returns on their investment based on macro economic indicators such as the GDP performance outlook, the dynamics of unemployment growth and the disposable income base of citizens having to repay loans. On all three fronts the outlook is not as encouraging to suggest that better prices for a basket of NPLs could be achieved in the short-term. But even more recently the dynamics of deposit flows is a matter of concern and reflects the hugely difficult position many households and businesses find themselves in. 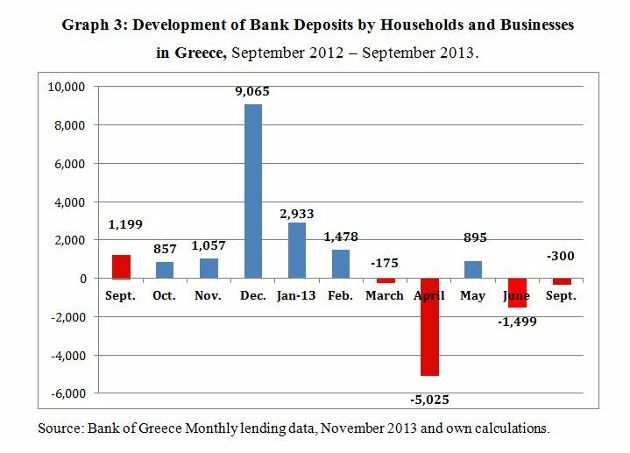 Greek bank deposits declined for a fourth straight month between June and September 2013. Deposits dropped by 0.5 percent in September compared to August 2013 and currently stand at 161.35 billion euros. According to the Bank of Greece the total net outflow during these four months amounted to 1.79 billion euros. It is not difficult to imagine where this money is going and for what it is being used. As households’ and businesses’ tax obligations continue to increase to unprecedented levels they are forced to resort to one of the few liquid assets still available to them: namely running down their bank accounts. · The percentage of SMEs reporting a fully successful loan application was lowest in Greece. By contrast, the complete rejection of their loan application among the 17 euro area countries was highest in Greece (page 14). This strong risk aversion of Greek banks in an environment of weak economic activity cannot continue to dominate the agenda. What needs to be done, what options are available and how fast can they be implemented? · Such additional liquidity should then have strings attached to it, e.g. the conditionality of using it for targeted SME financing. Such an approach would be a major point of departure to reenergize credit activity by Greek banks through liquidity-enhancing alternatives. But the domestic lenders cannot decide about the merits of such options on their own. They need to receive third-party approval from national authorities and international stakeholders. This is a politically-charged process and it is time consuming. *Jens Bastian is an independent economic and investment analyst for southeast Europe. From 2011 to 2013 he was a member of the European Commission Task Force for Greece in Athens. You can follow Jens on Twitter @Jens_Bastian. The Irish Independent, ‘Key Economists Criticising NAMA’, August 27th 2009. Kontogiannis, Dimitris, ‘Bad Bank Model Gains Ground in Greece’, Kathimerini, English edition, October 7th 2013. Tzortzi, Evgenia, ‘NPL Portfolio Offers Are ‘Humiliating’’, Kathimerini, English edition, October 27th 2013. ECB, ‘Survey on the Access to Finance of Small and Medium-sized Enterprises in the Euro Area’, October 2012 to March 2013, Frankfurt, April 2013. The benchmark 10-year EFSF bond is currently rated (long-term) at AA+ by Standard & Poor’s, Aa1 by Moody’s and AA+ by Fitch Ratings.